Now that we are in the midst of elections in India, it is useful to recall the paper published by Trilochan Sastry, founder chairman of the Association for Democratic Reforms and an academic at IIM Bangalore, in the Economic and Political Weekly a few months back. The table is self explanatory. 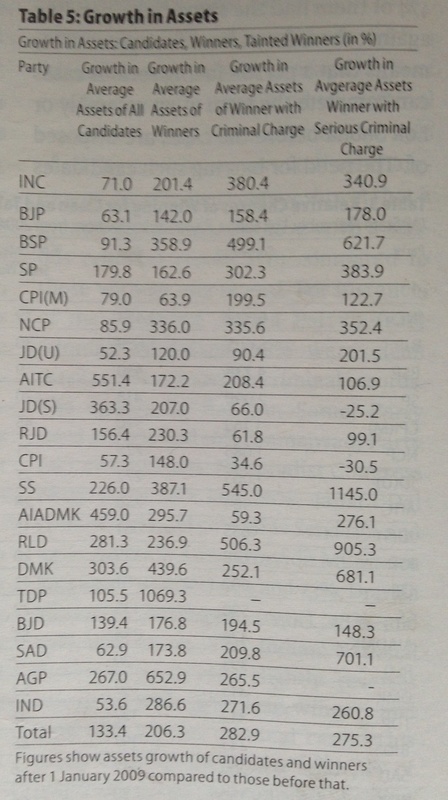 What is especially interesting is the growth of assets of candidates of regional parties like the RLD, AIADMC, TMC (Trinamool), DMK, JDS, Shiv Sena, AGP, SP, RJDTDP, BJD — almost without exception, candidates from these parties seem to be doing much “better” than those from the national parties. Trinamool congress is not listed. Mamata is doing a superb job any way, despite all the negative media publications. Umda. CPIM bhi phansi hui hai isme. Lekin CPI bechari negative growth mein ha, serious criminals ke column mein. Present Election law does not impose any limit on the election expenditure incurred by political parties. A small clarification is made in the present general elections.If a candidate accompanies a star campaigner of his/her party to his constituency in a helicopter or private plane,a part of the expenditure shall be added to his/her election expenditure. Narendra Modi came in helicopter to Varanasi to file his nomination.Let’s see how much money was spent on this and whether the amount is added to his personal election expenditure. This entry was posted on April 25, 2014 by Siddharth Varadarajan in Indian Politics, Political Economy.